Now you know where I get it from. Some people have said I have an obsession with Bibles. 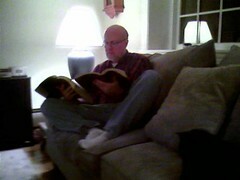 Well, here is my Dad reading two at once. My Mom snapped this picture with her phone. She said at one point he had a third Bible on his lap too. I definitely have a lot of Bibles as well, I’m not going to lie. From where I’m sitting in my room right now I can see… 15 Bibles. That’s not including the fact that some of them are parallel Bibles with multiple versions. So, I like Bibles. I figure if you’re going to collect something, why not collect something that can never stop changing your life (as long as you use it). I just never know. One day, maybe I too will have a need to read three Bibles simultaneously. No harm in being prepared.